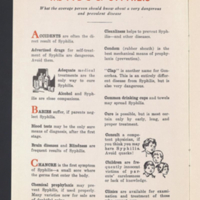 "What the average person should know about a very dangerous and prevalent disease"
This pamphlet includes short entires about syphilis in alphabetical order. It was included in National Social Hygiene Day Program Kits. 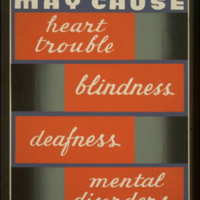 "Heart trouble, blindness, deafness, mental disorders : Have your blood tested"
This poster warns audiences about the effects of syphilis.